In some cases, baking soda or corn starch for visible oil stains and mild dishwashing detergeant. 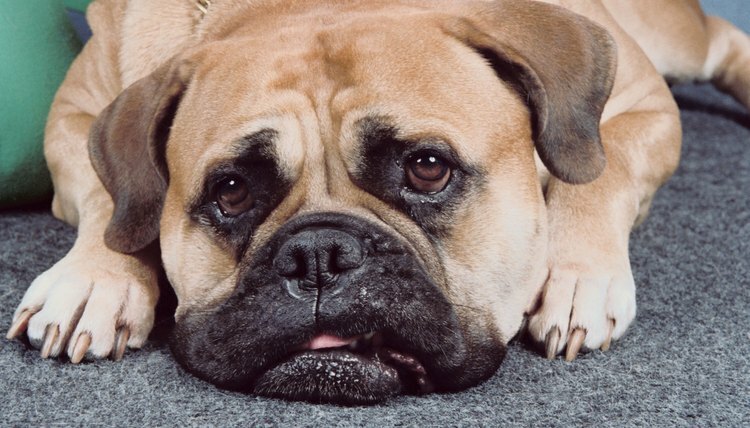 Anyone with a dog and carpeting is well acquainted with fighting the battle of stains. Jut like with urine, a dog's body oil can both stain and cause odor. Oil often saturates absorbent material like carpet. It can go beyond the surface that can treated. Because these oils are hard to get to through the carpet fibers, carpet backing and padding underneath, it can create an ideal condition for bacteria. Therefore, it's important you treat the stains. Spray a product like Paws or Bio-OX on an area of your carpeting. Blot the area with a white, absorbent cloth. Press down firmly for thirty seconds. Do not rub. Repeat blotting until the surface is dry. Another way to treat stains is to sprinkle a large amount of baking soda or cornstarch onto the carpet and leave overnight. Next vacuum up the powder. If there is a visible discoloration of the carpet, use a small amount of mild dish washing detergent to treat the area. It's best to remove the problem at the source, so you should begin by bathing your dog often. By doing this, you will help treat problems with excess oil. After bath-time, make sure you dry your dog well.